The Al Wathba Wetland Reserve in Abu Dhabi is home to a uniquely diverse ecosystem. The artificial wetlands were created in the heart of the Middle East, on the East of Abu Dhabi island, the capital city of the United Arab Emirates. The reserve has become an oasis of animal and plant life, attracting innumerable species of diverse wildlife to settle within the wetlands, most notably the spectacular flock of flamingos that call the wetlands home. 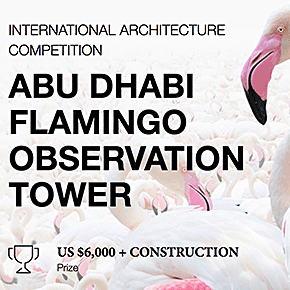 The Abu Dhabi Flamingo Observation Tower competition is looking to celebrate these magnificent creatures by tasking participants with designing a new observation tower for the reserve. Designs will need to be both in keeping with the look and purpose of the Al Wathba Wetland Reserve, while having the potential to become an iconic landmark in its own right. Design proposals can be developed individually or by teams (4 team members maximum). Correspondence with organizers must be conducted in English; All information submitted by participants must be in English.